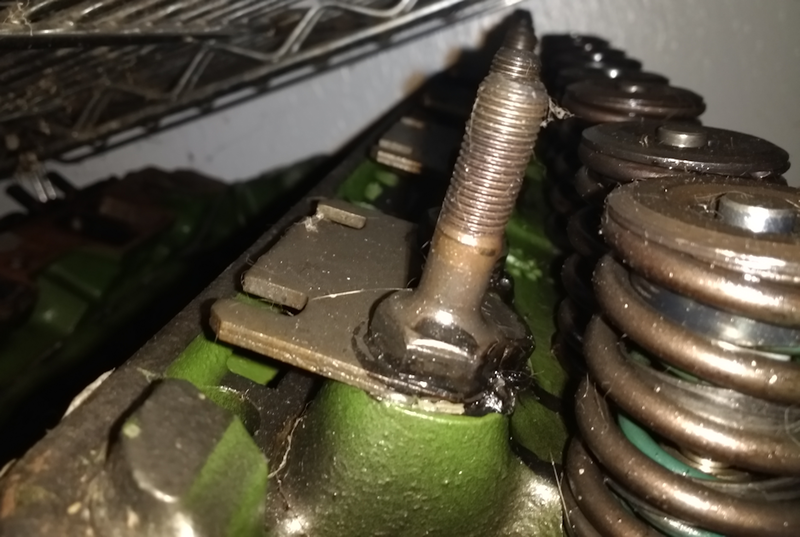 So I was looking a little closer at my current heads and I can definitely see where the rocker arms were grinding on the head. 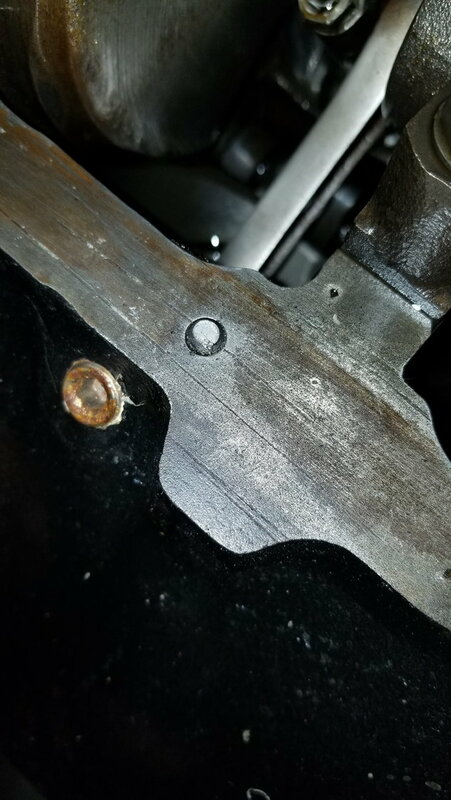 It looks like it was rubbing on the edges of the bosses where the stud screws in but it was on the inside of the rocker arm so if it were to be machined down the rough part of the rocker would still be in contact with the head (pictures below). So i guess no matter what material rocker arm I use either that will grind down or the boss of the head will grind down just because they have a rough cast or something like that so it acts like sandpaper. So no matter what I'm going to need to get that part of the head machined down. But if I do that does that mean I need to raise the rocker whatever thickness got machined down? Or does that mean I just need new push rods? I know some of the rocker studs have the hex on the outside instead of using an allen wrench so do the rockers ride on the hex? Sorry for all the questions I'm just trying to learn as much as I can before making a decision. 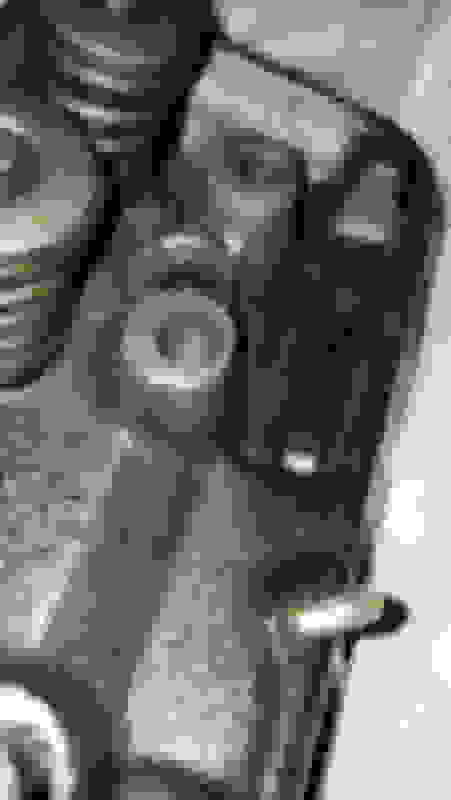 Based on what I can see of the push rod sweep across the valve stems, they're WAAAAAAAAYYYYY short. Like, .150" or more. Which is odd given that stock is 7.800" as measured the aftermarket way, and that would seem to be what you have. And of course, push rods that are too short, will require the rockers to be adjusted farther down onto the studs. That might have been the start of the cascade of events. Oh well. How did you go about selecting your push rod length? 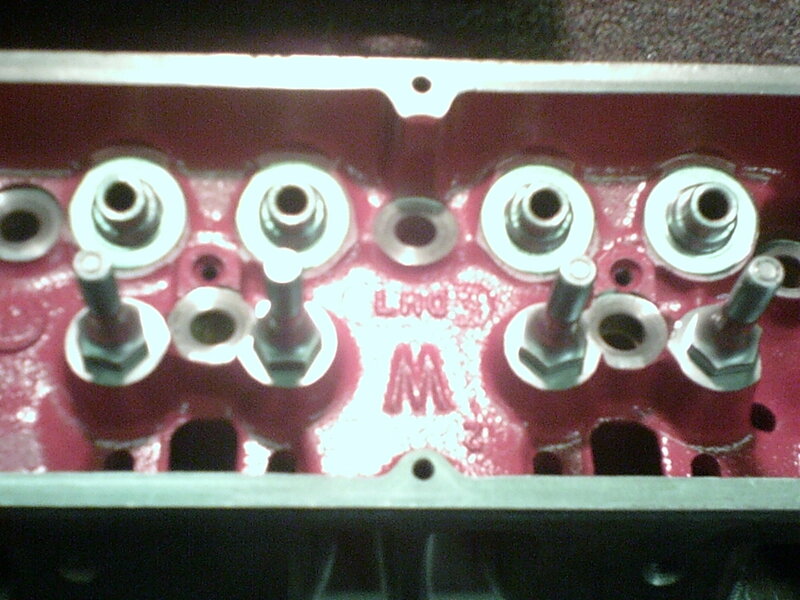 Here's what a set of the good double-hump heads (186 casting) looks like, with the better studs. The boss on these was cut down about .350" or so, which gave enough room for both the hex on the stud and the guide plate. It's pretty easy to see how much shorter these bosses are than yours. This valve train was set up for a XR282HR with 1.6 roller rockers,which gave about .540"/.554" of lift. These valves are .100" longer than stock besides, to give enough room for enough spring (Comp 986); if memory serves, the push rods in this motor ended up quite a bit longer than the "usual and customary" for a retrofit roller cam. I would add also, that the intake ones ended up with a washer under the hex, because the bottom of the stud hit the top of the intake runner down in the coolant passage there. They were cut down TOO far for these particular studs IOW. The black gunk you see on them is thread sealer. Obviously since they ALL go right directly into the water jacket, you gotta use sealer on the threads... another problem that was built into your motor, namely coolant leaking into the oil, that eventually would have bit you in the buttocks. Just like head bolts in this regard. I can't emphasize strongly enough, that those aren't a good set of heads to be pouring money into getting to work right. You need to buy so many little parts & pieces, and/or machine work, that they're economically not sensible to sink the money into. The suggestion of Vortecs is much more sensible; and similarly, you DON'T want to choose a path that pours money into them either, beyond what's messed up of what you've got or otherwise won't work. With those I would advise a set of these springs right here https://www.texas-speed.com/p-1383-l...od-to-550.aspx, Comp 787 retainers https://www.summitracing.com/parts/cca-787-16 and keepers that raise the retainers .050" such as https://www.summitracing.com/parts/m...4-16/overview/, with the stock "positive" seals for Vortec from Felpro. 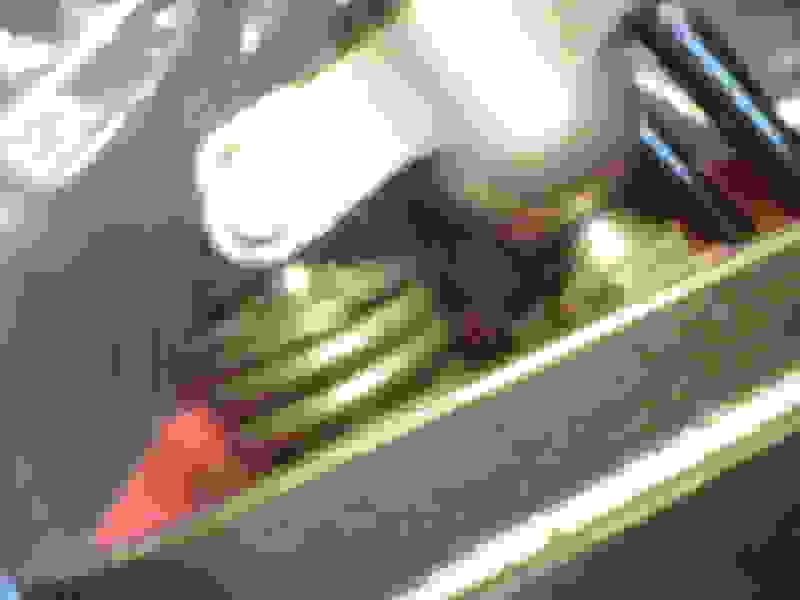 Shim the springs to 1.780 - 1.800"; you'll probably need a set of shims https://www.summitracing.com/search/department/engines-components/section/camshafts-valvetrain/part-type/valve-spring-shims/brand/howards-cams/outside-diameter-in/1-250-in/inside-diameter-in/0-875-in?N=4294949512%2B4294943569%2B4294918272%2B401597%2B4294945588%2B4294947209&PageSize=100&SortBy=Default&SortOrder=Ascending get one set of each thickness. File or grind or sand or whatever all the burrs and whatnot off of the rockers you have and re-use them... they're aluminum, won't last a real long time maybe 20k miles before they start to break, but I don't see where they're hurt bad enough that they're smoked, yet. Best not to spend the money til you have to. Get an adjustable push rod https://www.summitracing.com/parts/tfs-9001/overview/ and a pair of springs from Home Depot or similar that are just barely heavy enough to reliably close the valve, and find the length of the push rod that minimzes the width of the rocker tip sweep across the head; then add .050" (preload) to whatever you measure, and buy a set https://www.summitracing.com/search/brand/trick-flow-specialties/part-type/pushrods-assembled/wall-thickness-in/0-080-in/quantity/sold-as-a-set-of-16?N=400098%2B4294894148%2B4294887316%2B4294943488&PageSize=100&SortBy=BestKeywordMatch&SortOrder=Ascending&keyword=push%20rod. 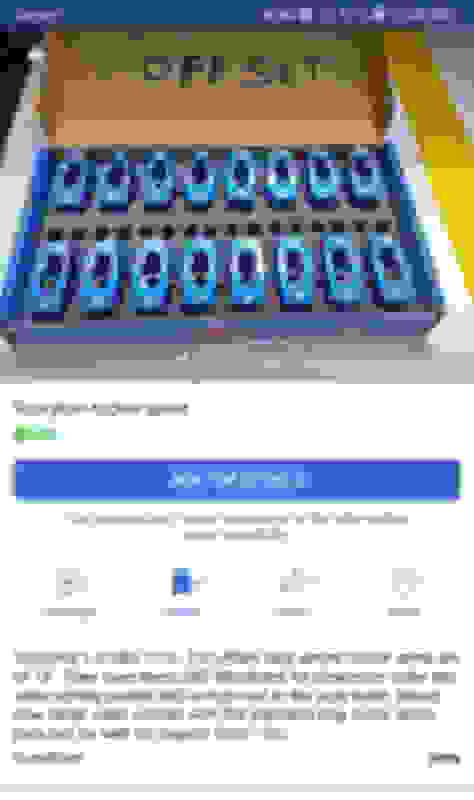 Last edited by sofakingdom; 07-29-2018 at 05:51 PM. I wasnt the one to build the engine, I bought the car from a guy on craiglist and he built the engine. He clearly wasnt the smartest guy because we are now 4 pages deep in this thread to fix the car not starting and then having a high idle but I would rather try my best to do what I can the right way. I know that they arent the best heads Im just trying to figure out my options. I know a few people who are friends of friends who might have spare heads just lying around so I'm going to try and give them a call before I either buy new ones or modify my existing ones. I appreciate everyone's help with this I know how much of a pain it is trying to figure out what is going on with everything. If your brother can machine the bosses down (for free), then it is worth doing these heads. Follow what Sofa said for the rest. So i talked to someone i know who has a bunch of experience with building cars and engines and what not, and he said that i shouldn't spend the extra money on vortec heads, the power gain isnt that much changing over. He went into detail on how the stock springs are garbage with that cam and may not be closing the valve all the way etc. so once i get all the valve train squared away i should be alright. The amount you need to machine down the bosses depends on whether you are going to use guideplates, or rely on the stock double D slots in the heads to guide the rockers. 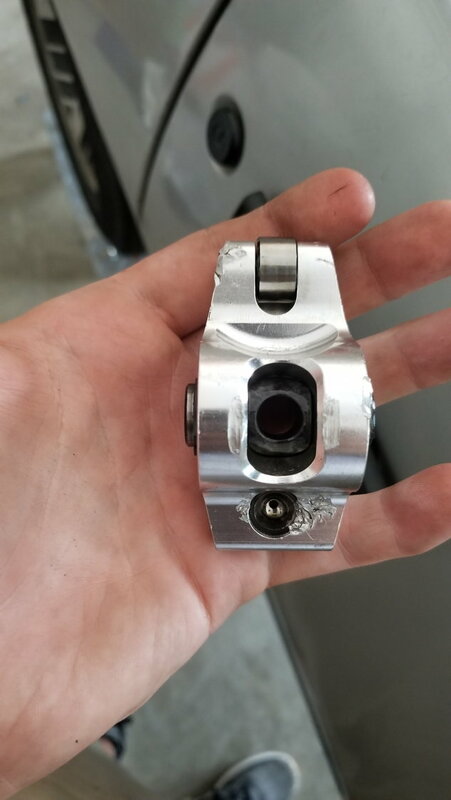 Whichever way you go, with your final valvetrain geometry correctly set up, the bottom of your rocker arm can't end up so low on the stud that you have the same problem you have now. If using studs with the hex, the rocker needs to be sitting in the proper position for no interference between the rocker and the hex (see picture). If using guideplates, the additional thickness of the plate must be accounted for, and added to the amount being machined off. You also need to open the stock double D slots in the heads with a 1/2" drill bit or end mill. You can only guide the pushrod in 1 location. Hey guys. Im waiting for parts to come in right now. The oil pan and trans pan appear to be leaking so i need to fix that as well as the issue with the rockers. There are bolts missing and loose on the oil pan and i havent been able to look at the trans yet. I dont think ill be able to take off the oil pan without pulling the engine because there isnt much room in between the pan and cross member. To get the oil pan off you either need to lift the engine or remove the trans and flywheel. You can do a one piece replacement gasket without removing the pan. If you are already removing the motor that is the way to go. much changing over." this advice came from a person with absolutely NO EXPERIENCE BUILDING SMALL BLOCK CHEVROLET ENGINES ON A BUDGET FOR POWER. 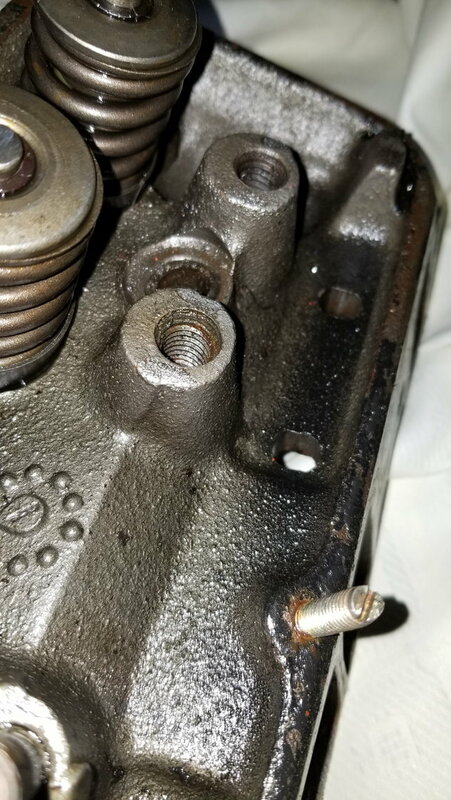 what your "experienced friend"told you is total bullcrap......vortec heads are possibly the best "stock" cast iron small block Chevrolet head of all time,PERIOD. in what works and what does not.the average joe mechanic doesn't work on these types of cars,he will not have a clue what makes the most power. I'll back you on that but it comes with a caveat. They make power in stock form but only up to a point. And therein lies the argument. I enjoyed my box stock Vortecs and smallish cam for a number of racing seasons. The smallish cam being the operative phrase there because beyond that cam with the .450" lift, the Vortecs need modifications. At that point, after upgraded valve springs (with or without machining), screw in studs, opening up the push rod holes, etc, it gets to where you have to ask if it's worth it. In my case, since I already had the heads, I could make the improvements and not suffer from "sticker shock" as I had considered the original purchase a sunk cost. The mods were just another expense in the hotrodding game. Now that said, if I look back on the total that I spent on those heads, I could have purchased an aftermarket aluminium head with more potential. But budgets being what they are, I did it incrementally. Having sold those modified Vortecs, I recouped some of my expenses. On the flip side, whoever bought them got real value because they went right into service despite having logged thousands of miles. That brings up another solid point about the Vortecs. If you keep away from excessive heat and avoid the common cracking problems, they're very durable mostly due to the cast iron valve guides. 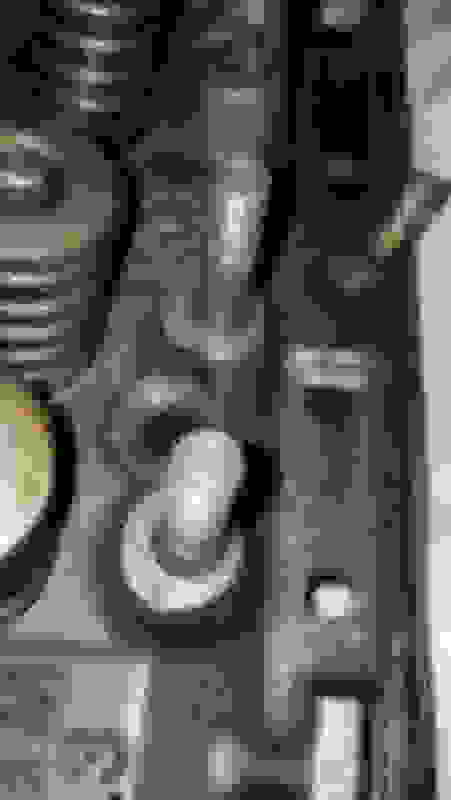 It takes some porting to bring your current heads up to the level of the vaunted Vortec intake port and after that you still have the machine work to make them suitable in a higher performance application. i will agree with your assessment as well,they have limitations and do not like a lot of porting .they are also fairly difficult to find in the wild without a lot of cracking.ive heard people looking through 5 sets of vortec heads at a junkyard and finding 1 good one>>>? (under 400 horsepower)small-block with a cam that doesn't have insane lift,probably under 0.450"and of course you need the vortec specific intake whether you go carb or efi. Your numbers aren't far off. I bought my Vortecs new for about 600 CDN. At that time we were pretty close to par with the US dollar so it was a pretty good deal. Ran them a couple of years, over-revved with the stock springs and bent a couple of valves. Fixed that. It wasn't until the engine ate the flat tappet cam and I made the switch to a hydraulic roller that I had to upgrade. That meant springs (Comp 26918), screw in studs, guide plates (I went with a standard rocker), resurface. $400 in parts. $500 in labour (which included a valve job) put me into aftermarket head territory. But I had three years out of the stockers so that counts for something. Those heads, 10:1 CR and a 224/230 w/ .530/.540 lift put a 3700 lb 3rd gen to 12.7x @ 106 mph. Maybe 400 HP? Some here say less. that's pretty damned respectable and i would think you are definitely knocking on 400 horsepower's door with that time/speed . and you can offer real world experience,thanks for sharing. flooding could be floats needle valve even the air cleaner if it is too small. .. with that time/speed . That was at Toronto Motorsports Park and the corrected ET/MPH from the poor 2200' DA of the day works out to 12.45 @ 109. So yeah, there's definitely potential in the Vortecs with the right cam and CR. Hey guys, I understand that those vortec heads are the best stock gm heads. The guys ive been talking to has been racing for 20+ years and is very reliable. When i called him a few weeks ago he was telling me he has ran 11's on a 350 with camel hump heads. 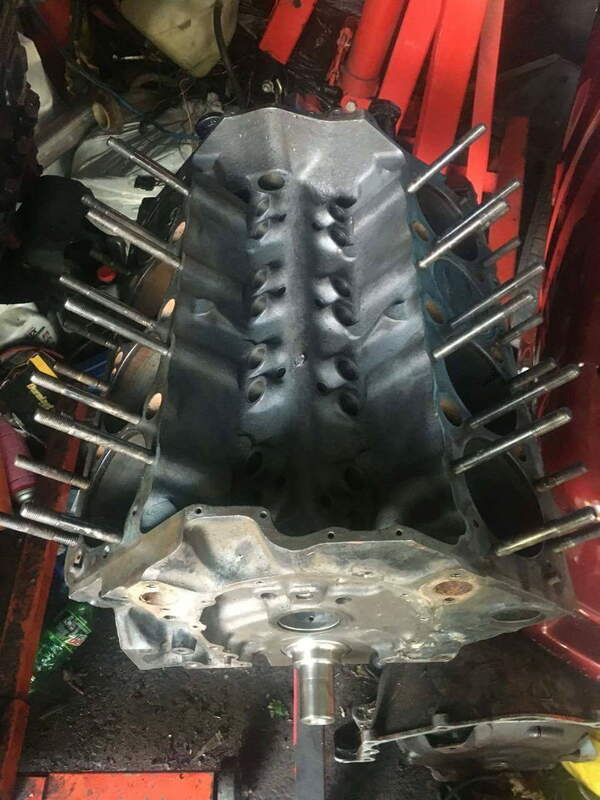 I respect all of your opinions but i also cant put out 400 dollars for heads and then whatever other things i would need to get them to fit (intake, machining of the heads, pushrods etc.) Right now im still trying to get ready to pull my engine to see how bad it might actually be. Im worried about the bearings being torn up from all the aluminum shavings that came from the rockers. I want to clean all the crap out and go from there. Also, when i pulled the other rockers off some of them are a worse than the others i showed before. Also, right now one of the heads is off and i was wondering if i can pull the engine using the holes in the block for the heads? I know a lot of people use the plates that you can attach where the carb goes but ive also heard dont use those with an aluminum intake. Last edited by Gompeh; 08-22-2018 at 07:20 AM. i would clean up what you have ,properly install the cam(degree it if possible)get the proper length push-rods and properly install the lifters,rockers after confirming that they are correct and will actually work,then find tdc,then set the timing. IMO get it running before buying anything else,you will just introduce another variable if you change these now.you need to machine the bosses on the heads and get proper screw in studs before doing anything. (too much lift,not enough spring/clearance) and also did not check the push-rod length.that my suspicion.i also suspect it was never properly broken in so it may round off the lobes and kill the lifters. and yes,you can probably do 11s with camel hump heads with 50+ hours of port work,extremely high compression,a very radical cam and more.....they are old school tech and are easily bettered. Still sounds like a good idea. ...and yes,you can probably do 11s with camel hump heads with 50+ hours of port work,extremely high compression,a very radical cam and more.....they are old school tech and are easily bettered. Ah. The good old days. I was part of that crowd. And the heads might last 50 passes before they cracked. It's so much easier to be fast these days. Those are for 7/16" studs. Yours are 3/8". Offset means that they're for non-stock heads. Specifically, ones with YUUUUUUUJJJJE intake ports, that are so wide that the push rod has to be moved over to accommodate the port. 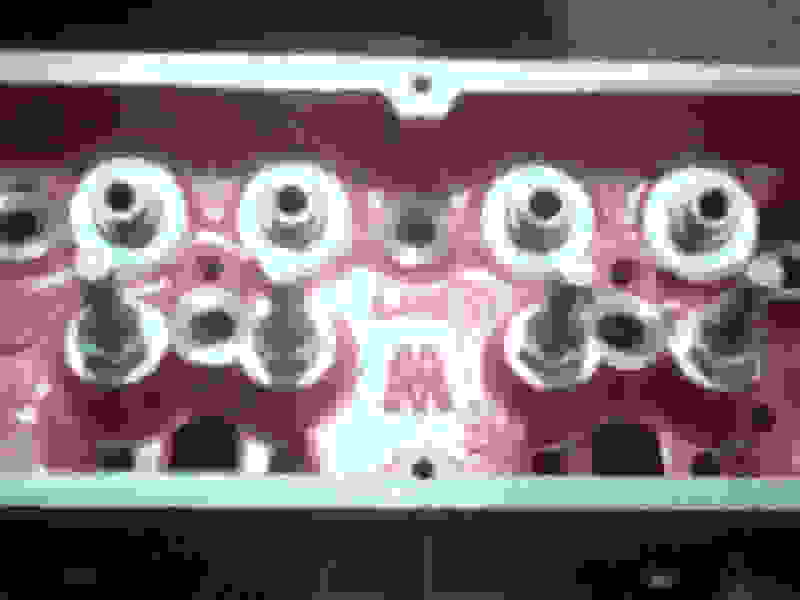 You can look at your heads and see how the push rod runs right up against the "outer" wall of each intake port, and ultimately acts as a limit to how large the port can get in that direction. People have been known to enlarge the port anyway and put a brass tube in to fill in the holes they create. "C&C" gives me a good laugh... the actual expression is "CNC", which is the TLA for "computerized numerical control". Basically where you generate a program to control and direct a machine that produces the shape you want using whatever machining method the machine performs (milling, laser cutting, etc. ), and it automatically runs on whatever you put into the machine. The modern way to produce repeatable "custom" shapes such as head porting: it allows identical ports to be created out of raw castings. But they don't fit your motor, so, ... no bueno. That rocker in your hand is really something. That's just totally beat to hell. Doesn't look like it's not useable, just, looks like a 4-yr-old has worked it over with a hammer or something. It has damage that I can't figure out what it is or how it even got there. This looks more and more like you got someone's failed "project" dumped on you. For your SBC, rocker studs come in 2 usual configurations - for 3/8" rockers and 7/16" rockers, but both types of stud will have 7/16" threads on the bottom to thread into the heads. So the top part where the poly lock is will be 3/8"? No, you have 3/8" rocker studs. That # is for the part that the rocker goes on, up at the top. Their thread is 3/8"-24 (fine) for the nuts. From what I can recall from the earlier posts, you have those "repair" type studs (not "performance") with the 3/8" -16 threads (std) where they go into the casting. "Performance" ones, with the hex, are usually 7/16" - 14 (std thread) on that part. But that's not important to the issue at hand. You can pick up a nut at HD or wherever to verify. Hey guys, so they are the 3/8 stud but the part that screws into the block its 7/16. I found some comp cams 1.5 roller tip rockers for pretty cheap so im going to get those instead of having to worry about my old ones getting any worse. I think im going to need new rocker studs because some of the ones i have came out pulling the old rockers and they dont have that hex on the bottom like almost every other one. The place where my brother works should be able to machine the heads. Also the water jackets look pretty gross so i was thinking about hot tanking the block to get it all cleared out. Idk if there is anything you can do yourself to clean it out instead of having to do that but if there is that would be nice to know. That should get you started. Unless you use ARP fasteners, use what's outlined in the link. If you use ARP fasteners, use ARP's recommendations. Idk if there is anything you can do yourself to clean it out instead of having to do that but if there is that would be nice to know. Local car wash and a pocket full of quarters late at night. Ok, i didnt know if it would rust the block if i used my pressure washer instead of distilled water or anything meant to clean it. your block at the same time. So the engine is out and im starting to take it apart. Theres a few things that arent great. Ive only taken off cap #5 so far and the bearing looks pretty bad. Theres a bolt that got sheared off for the oil pan, random bits of gasket in the water jacks, the trans mountis broke etc. That bolt is an ez fix. If the block is not a roller block (cant remember) I would look for one and have it freshened up. You would probably want to do that anyway might as well upgrade. you will get a roller block,vortec heads(4 bolt mains i believe,i could be wrong) and an awesome starting point to a good 350 capable of some VERY decent power. if you are pulling caps ,rods,pistons,lifters or anything else keep them in proper order and orientation(you can stamp the cap/block with numbers),take lots of pictures,label EVERYTHING. carefully and retapped or use GOOD extractors.i broke a manifold stud,center punched the broken stud,redrilled and tapped the bolt hole and its good as new. So thats what the block looks like (this is a pic from when the guy i bought it from was assembling it). I didnt know that there was a roller and non roller block. All the caps are lifters are out and labeled. The only things still in the car are the crank and pistons. The cam looks fine but the bearings are absolutely garbage. The crank looks like i could be machined but it has some grooves you can just feel. one trick to buying junkyard engines is,if you can look at the vehicle dont buy an engine from a vehicle were the body is in great condition. if it has a rear (or front)or side impact and lower kms often times you can get a really good engine but like anything,its the luck of the draw. if you can do it,buy a running vehicle and get everything together to make the swap easier with less little things nickel and diming you to death. i hope this helps,we suggested the roller block because a roller cam is generally better(more aggressive lift with less valve-train stress),you can reuse roller lifters and the one piece rear main seal blocks usually leak a lot less. if your crank has grooves/ridges it needs to be reground.if the bearing shells spun and damaged the caps or block you will need a line honing. will need either a re-hone or possibly an overbore then new rings or pistons and rings depending on what you find.deck yyour block at the same time. if they are machining the block you will need NEW CAM BEARINGS after hot tanking,baking or whatever they do. before sending it in the machine shop(if this is what you are going to do) ,get ALL THE FREEZE PLUGS OUT ,get any oil galley set screws,plugs etc and remove them and pay attention to were they all need to be when you reassemble it all. a decent 305 would be smart if you can find one reasonable enough(i bought a complete running 1992 tpi 305 for $300,thats the 215 horsepower version )so you can rebuild your other engine as time and money permits or do something else. who knows why its there in the first place. Most often, though of course not always, because it was DRIVING DOWN THE ROAD and it GOT IN A WRECK. Out of ALL the possible places to pick up a good used motor, that is THE ONE BEST source. Not saying "every" piece they have will be gold; not saying they're all perfect; only, that if you consider the odds, a car DRIVING DOWN THE ROAD AND GOT WRECKED is onewholehelluvalot more likely (less unlikely?) to be scam bait, than let's say, CL. Don't pay money for a 305. There's people on this forum that'll prolly SHIP YOU theirs for free, because it's cheeeeeeeper than hiring the junk man to haul it off. If I were in your shoes RIGHT NOW, I'd throw that old POS in the trash, and start looking AT JUNKYARDS for a 96-2000 truck 350. With heads, known running, guaranteed good. You can't fix a efffed up one ANY CHEEEEEPER than just paying for it that way up front. Pay me now or pay me LOTS MORE later.